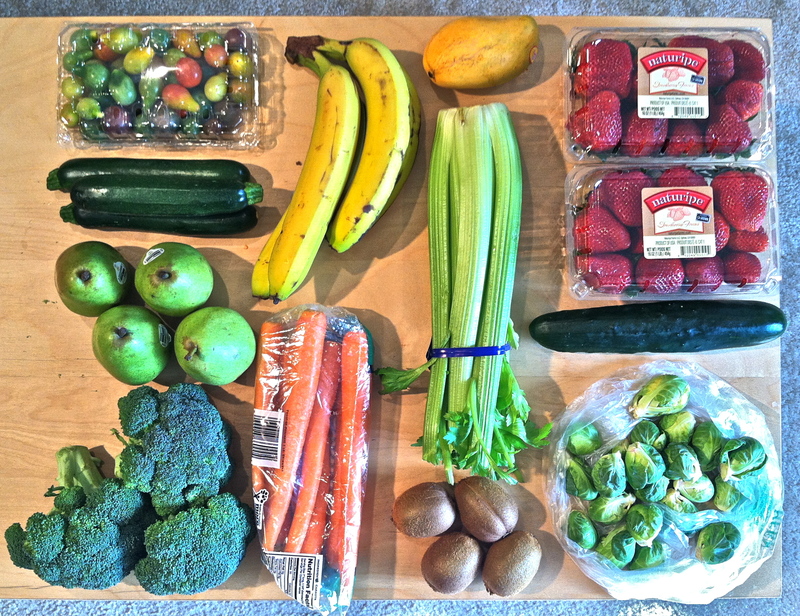 Produce Haul. Pretty Dinner. Pepinos. | Keep It Up, David! Produce Haul. Pretty Dinner. Pepinos. Day 1 of being back on track was a success! (See why I needed to get back on track here.) I took a killer class at my new new gym called Bodyweb Bootcamp with TRX, which was a ton of fun and completely brutal. TRX is a form of training with straps and handles that strengthens every muscle, with only your body weight as resistance. Kinda hard to explain, but easier to watch – so check out this video of a class at a different Crunch gym. From left to right, top to bottom: heirloom cherry tomatoes, zucchini, pears, broccoli, bananas, carrots, an ataulfo mango, celery, kiwis, strawberries, cucumber, brussel sprouts. 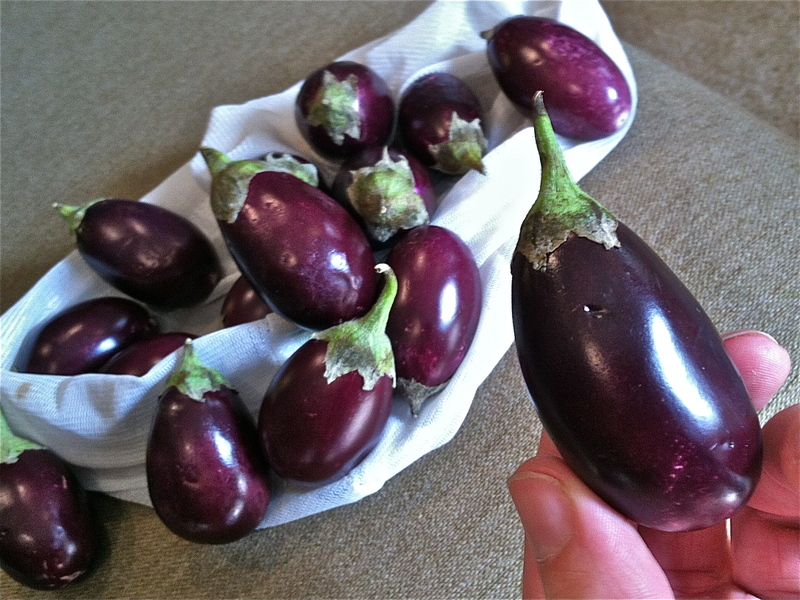 I also picked up a bunch of baby eggplants – how could I resist these guys? Plus, they were 15 for a dollar – the price is right! I don’t buy eggplant all that often. I like it, but I prefer buying vegetables that I could eat raw if I wanted to. Plus, while eggplants are good for you (a nice source for potassium! ), they also have the potential of sabotaging a healthy meal, since they soak up oil like a sponge, making it easier for me to use more oil than I was planning. 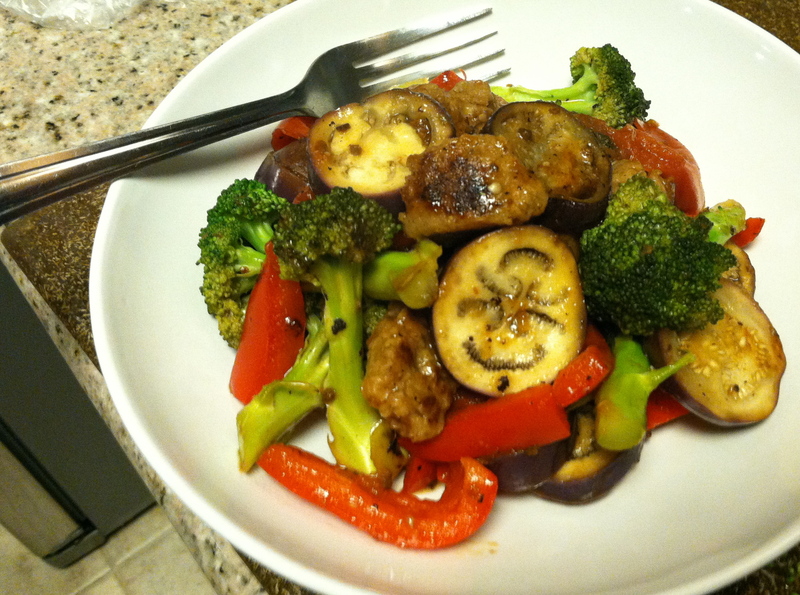 For protein, I used vegetarian sausage. 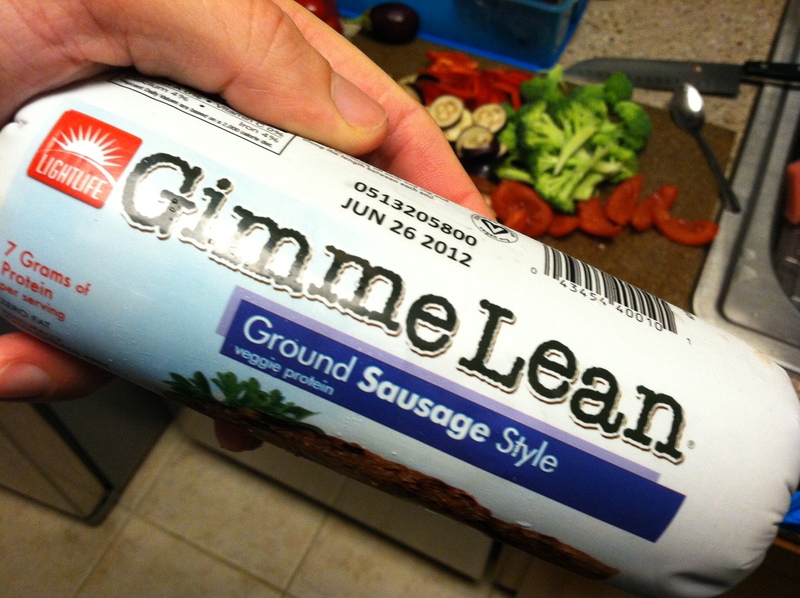 Gimme Lean ground sausage is fat- and cholesterol-free, and each serving has 60 calories and 310 mgs of sodium. You can find it at a lot of regular grocery stores, near the tofu (like tofu, it’s soy-based). A serving is 1/7th of that package, but I wasn’t exact about portioning that out, so I probably ended up with a little more than a serving. I cut it into chunks and started it going with some garlic in a big skillet that I slicked with non-stick spray. 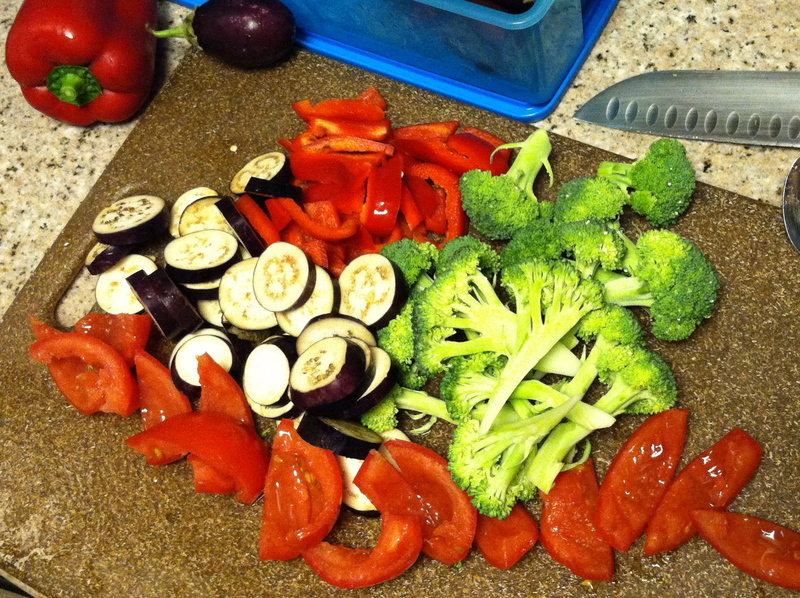 After a few minutes, I added all the veggies. After a few more minutes, I added about 1/4 cup of low-cal, non-fat balsamic vinaigrette. After a few more minutes, dinner was served! That’s half the finished product, and I ate the other half, too! Earlier in the day, I tried a type of fruit that I’ve never eaten before. 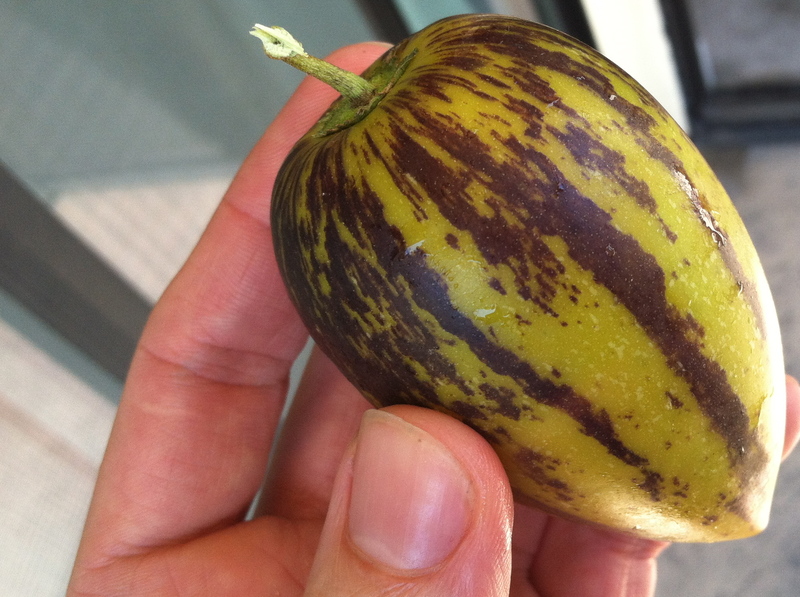 Have you ever eaten a pepino? They’re sometimes called pepino melons or pepino dulce (‘pepino’ means cucumber in Spanish, so ‘pepino dulce’ means sweet cucumber). I got these at the farmers’ market over the weekend – all three cost me 80 cents. I had never even heard of them before, so of course I had to try them out! Pepinos are native to the western side of South America, and despite sometimes being called pepino melons, they’re not related to either cucumbers or melon. Scientifically, they’re members of the nightshade family, alongside tomatoes, eggplants, potatoes, and tobacco (the nightshade family is very diverse!). My first pepino was tasty! 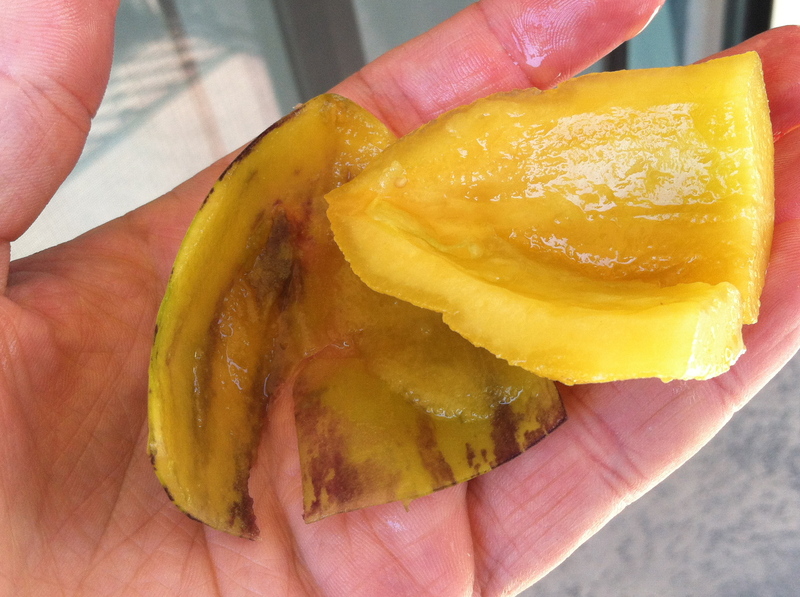 It had the texture of a cantaloupe, but tasted more tropical, like mango or maybe even a little banana-ish. I ate all three, and the second two weren’t quite as good. 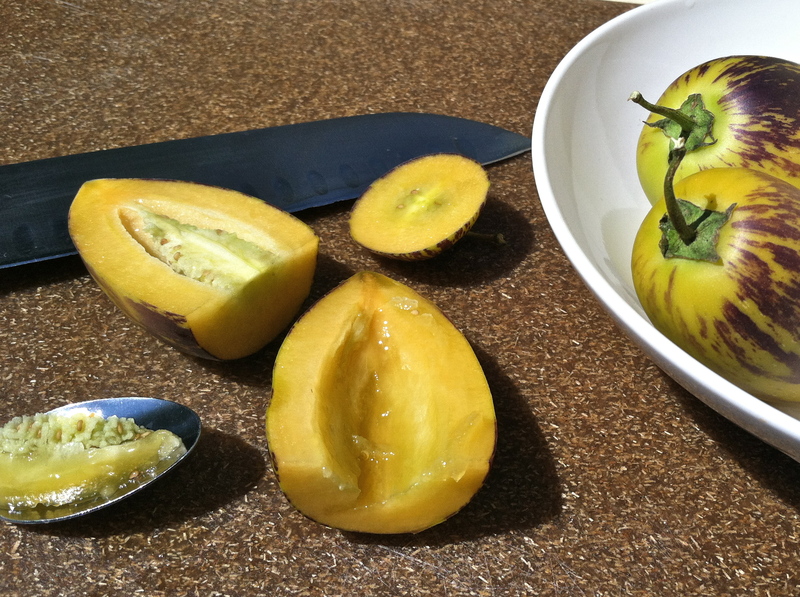 I don’t think they were as ripe as the first one, and the flavor was less intense – more like a slightly sweet cucumber (maybe that’s how they got their name!). All in all, something I’d probably pick up again if I saw them at the farmers’ market. Now onto Day 2 of being back on track! This entry was posted on Thursday, April 12th, 2012 at 4:32 am and is filed under Uncategorized. You can follow any responses to this entry through the RSS 2.0 feed. You can leave a response, or trackback from your own site. 4 Responses to Produce Haul. Pretty Dinner. Pepinos. It’s a diffent pepino a little. 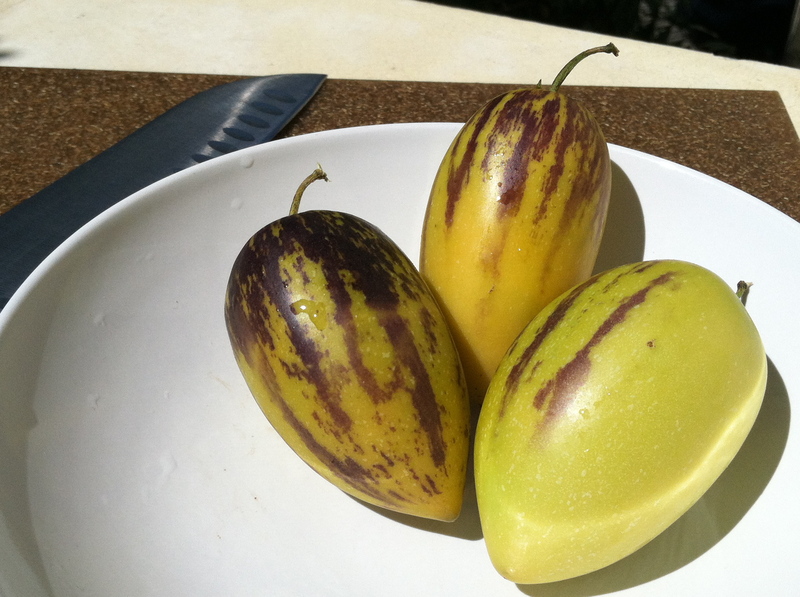 Where can i buy this pepino’s seeds? Thanks for stopping by. I’m not going to be much help, though – I bought these at a local farmers market years ago. I have no idea where to get the seeds! Ok. Thanks. I’ll try to get the seeds.